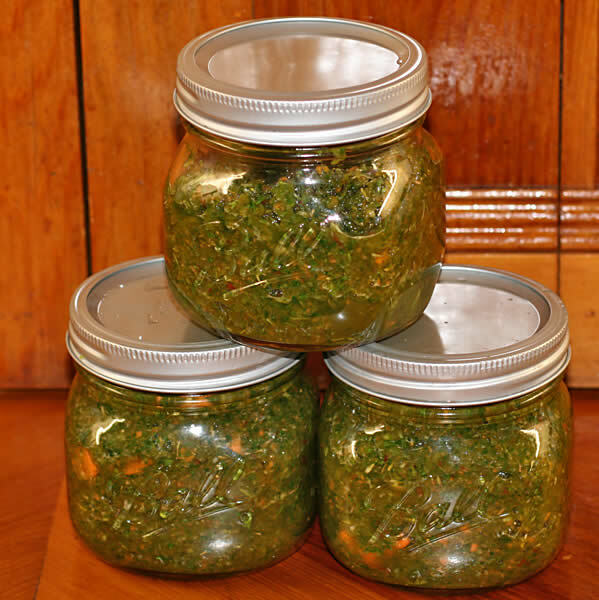 Today I made 3 pots of a vegetable bouillon stock base that you can keep on the shelf for up to 6 months. I have to admit my doubts about it, but nothing venture nothing gain. This recipe comes from the River Cottage Handbook, No. 2, Preserves. While I give the vegetables and herbs I use below, so long as you keep to weights you can use just about anything (although I think parsley has to stay in as one of the foundation herbs), just what you have available in the garden, but make sure you use lots and lots of vegetables. You will need either a very good blender or a food processor for this. Pop all ingredients into a blender or food processor and blend together – you will get a moist, granular paste. Spoon into sterlised containers and seal with vinegar-proof lids. To make into a base/stock, use two teaspoons to 500 ml of hot water. Once opened, put jar into the fridge. Unopened they are supposed to last up to 6 months on the shelf. I forgot to include both the garlic and the tomatoes … I have had a bad day today and my mind wasn’t on what I was doing; still it smells OK. Picture below. Combine all ingredients in a ceramic or stainless steel bowl or bucket. Let stand 2 days. Strain and bottle. Ready in two to three weeks. This can get very fizzy so it is a good idea to watch your bottles for imminent explosions. Mine will be ready to bottle tomorrow and I am going to bottle most of it into swing-top glass bottles, but use one 600 ml plastic soft drink bottle so I can keep an eye on it (if bottle starts to swell and go hard, time to release gas from all of them!). UPDATE: Seth is home. And had to go straight back to the clock doctor again. Now he’s home again and, finally, working OK. He tick tocked fine when he got home but when he tried to strike the hour and half hour, he went all gurgly and ended with a whimper rather than a series of resounding bells. Seems he’d slipped a spring on the way home. *sigh* So he went back, got re-sprung, and now is home and both tic tocks and bells. Now Walter is off down at the doctor’s. Everything has gone wrong today. This and that – all day has been spent reacting to things rather than getting things done. I suppose that at least I got in an extra 5,000 steps with all the trips to the clock doctor! Yes, market is on Sundays. Sorry, should have mentioned that. I am *finally* about to get outside, although I’ve been getting lots of sun walking to and fro with the blasted clock! Oh? giving the clock some exercise? – sounds like it needs to practice its running… ar! ar!